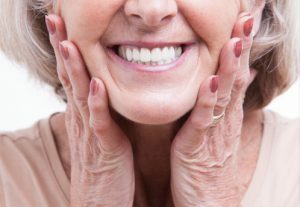 While conventional dentures remain a viable option for tooth replacement among patients who are missing most or all of their teeth, they certainly are not problem-free. With removable dentures, only about 10 percent of a person’s natural ability to bite and chew is restored. In addition, normal speech might be more difficult, and these dentures often cause painful gum sores and blisters. Finally, because a full denture wearer does not have any teeth or teeth roots to stimulate a healthy jawbone, facial sagging often makes a person look aged. Fortunately, there is an alternative that combines the natural smile qualities of modern dentures with the support of dental implants. At Independence Family Dentistry in Independence, KY, Dr. Danny Nakhla and his staff offer the All-on-4 treatment, which gives edentulous patients fixed dentures in just one visit. As the name implies, All-on-4 involves the surgical placement of four dental implants that hold your new full prosthesis in place. First, let’s understand what a dental implant is. An implant is a very small titanium post that is surgically positioned in the jawbone. This post replicates the root of a missing tooth. And because the post is made of titanium, which is a biocompatible material, it fuses with your bone tissue in a unique symbiotic relationship: the post stimulates healthy bone growth and the bone firmly secures the implant. In the case of All-on-4 treatment, Dr. Nakhla strategically positions four dental implants along one full arch. Once in place, these four implants securely hold your fixed full-denture. All-on-4 can be used for tooth replacement on both your upper and lower arches of teeth. Moreover, there is no wait time between the implant surgery and the attachment of your arch prosthesis. The entire treatment is completed in just one visit. So, you walk out of Independence Family Dentistry with a new smile and a renewed and functional ability to bite, chew and talk. If you have been dealing with challenges of tooth loss—or if you have removable dentures and you aren’t satisfied with the utility they provide—then contact Independence Family Dentistry to schedule a consultation regarding the All-on-4 treatment. Dr. Nakhla is the dentist northern Kentucky relies on for not only restorative dentistry, but family dentistry, cosmetic dentistry and orthodontics with Invisalign® clear braces. Our Independence, KY, office welcomes patients from throughout the Northern Kentucky and Cincinnati area.